I bought this for my laundry room and I like the plush feel and that fact that it doesn't have the rubber backing that falls apart when you wash it. 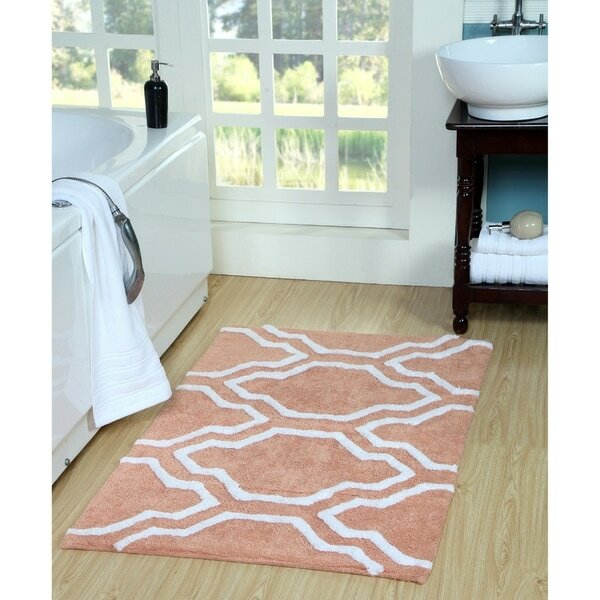 Create a homey feel in your bathroom with this Saffron Fabs Cotton Quatrefoil Bath Rug. Available in blue, grey and beige, this rug features a geometric design that adds a casual, relaxed feel to your bathroom. Made of cotton, this rug comes in 3 sizes to fit your space. This cozy rug provides high water absorbance, perfect for bathrooms as these soaks water quickly. Thick pile texture enhances its softness. This rug is dyed with eco-friendly colors using sustainable AZO free dyes. Saffron Fabs bath rugs can be used as area rug in kitchen, bed room, and family room. This rug is machine washable, cold separately; gentle cycle. Do not pull long yarn ends; trim with scissors. It is recommended to use a rug pad underneath, although heavy rugs do not slip due to their weight. Please do not select thick (heavier GSF) rugs if door opens on top of rug as you may find an issue opening the door due to the rug thickness. This rug is handmade, therefore there may be some variance in color/ size/ design. Rugs are folded before shipping and you may find crease line, which with some usage crease line will settle. Dimensions 34.0 In. X 21.0 In. X 0.7 In. I purchased 2 of these rugs for my bathroom. I followed the washing instructions on the back before using. When drying in a cool dryer, the rugs shed tremendously and most of the grey design completely pulled apart from the backing. I was going to return the rugs, but it was going to cost over $* in shipping. These rugs have been relegated to the garage. Don't waster your money. Love this bath rug! Perfect color and perfect size...and it washes well. This rug is really nice..I purchased this for my guest bathroom in blue. It's actually more of any aqua color which is what I wanted. It's a WIN! I like the color and design of the rug. Absolutely love this bath rug, we ordered the gray and white one in the larger size fits perfect in our bathroom. The material is super soft and I love that you don’t need a grip pad for underneath as we have all tile floors the carpet does not slide. Great buy for the price, also received it in 2 days super fast shipping. Five stars all the way! Like the material and colors, only disadvantage is that the grey raised pattern leaves dark 'fuzzies' on the white cotton areas after washing. This was somewhat to be expected but did not think it would be a bit time consuming to get it picked and vacuumed off. Other than that quality very good and nice thick bath mat! 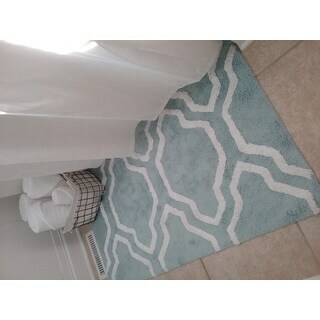 I love this rug very soft & accents my bathroom. We bought this rug for a Xmas present. The couple is still using the same rug. It last a long time. Wears well. I love my new white/new blue bath rugs! I bought both a large and small rug to fit by the bath tub and shower, resp. They are very cute and soft -they definitely brighten up the master bathroom! I bought the cream and gold, which really went well with my bathroom decor. It was beautiful until I washed the rugs. They shed so bad that I had to literally clean out my wash machine because of the shedding. I’m very disappointed! Lately, I find myself returning things due to the quality. I think it’s time for Overstock and I part ways. Color was true to the picture. Great choice. Plush rug, everything we were looking for including the correct color. Have washed it a couple of times now and still looks outstanding. The rug is very nice. It stays in its place. My cat used to slide on my other one. I straighten all the time. This one does not not move. I would highly recommend it. Decent bath rug, but the design part is raised like 1/2 an inches so feels weird on your feet. Fairly easy to clean, can toss it in the wash no problem. Still going strong 3 years later and that says something. Looks great. Soft on the feet and has not needed many trips the the washing machine. Would reccomend. The color was very nice even though it was lighter that I expected. Could be a little thicker for the bathroom but otherwise a nice rug. good size. "how thick is this rug; the door needs close over it?" Pile Height is 0.6 ''. "The color you are calling "beige" looks a lot like gold to me , which is what I am looking for...could that be the case?" It is the same color as it look in picture, more like light to medium Brown.